Place carrots, potatoes, and apples in crock pot. Add meat and sprinkle with salt, thyme, and onion. Pour cider over meat and cover. Cook in crock pot on low heat 10-12 hours. 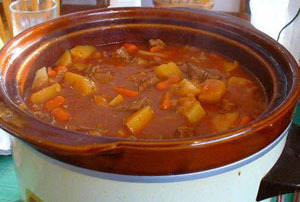 If a thicker stew is desired, make a paste using 1/4 cup cooking liquid and 1/4 cup flour. Stir until smooth. Slowly add to the stew. Cook until thickened.